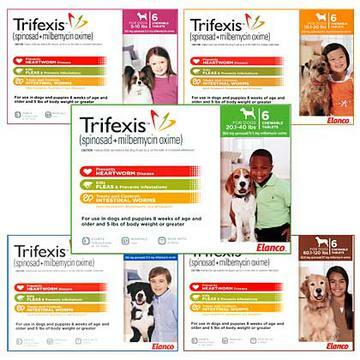 Trifexis is a chewable tablet that kills fleas and prevents infestations, protects against heartworms, and treats and controls adult hookworm, roundworm, and whipworm infections for Dogs (8 weeks of age and older and weighing at least 5 lbs. Spinosad, an active ingredient in Trifexis, starts to work within 30 minutes to kill fleas and has been proven to kill 100% of all biting fleas within 4 hours. Trifexis also kills flea eggs before they can mature, which helps to end the flea life cycle. Trifexis prevents heartworm disease by killing microfilariae and larvae from maturing into adult heartworms. Dogs should be tested for heartworm if there is any possibility that they may have a pre-existing heartworm infestation. Administer it directly into the mouth as a tablet or give it as a treat. Can be given along with food. Trifexis is a multi-parasitic treatment. The active ingredient spinosad works against adult fleas and controls flea infestation. The other ingredient milbemycin oxime acts on intestinal worms and controls immature stages of heartworms. The oral treatment is eliminates worms and fleas. It protects dogs against multiple parasitic infections. Comfortis Plus comes in various packs according to dog weights. The monthly treatment is highly helpful in controlling recurring infection.